Orders placed today will be shipped in 7 BUSINESS days. Announcement TO AVOID DELAYS PLEASE PROVIDE FULL MONOGRAMMING INSTRUCTIONS ON YOUR ORDER. To see what is needed to personalize, please read the description of the item/items that you are purchasing. IF YOU ONLY LEAVE A NAME OR INITIALS TO BE EMBROIDERED AN APPROPRIATE FONT STYLE AND THREAD COLOR WILL BE CHOSE FOR THE ITEM OR ITEMS THAT YOU ORDER. GIFT CARD--When ordering please be sure to let me know if your purchase is a gift. I will be happy to include a gift card with your personal message. INVOICES AND NOTIFICATION OF YOUR PURCHASE--You will receive written confirmation of your purchase from Etsy. I do try to personally awknowledge each order but during busy seasons that is not always possible. Many of the items that I offer in my shop are handmade by me, but there are also many items that I do not make myself. I embellish those items by embroidering designs or monograms on them. Some of the designs or created by me and others are purchased from vendors. I DO NOT sell blank items if I do not make them by hand. TO AVOID DELAYS PLEASE PROVIDE FULL MONOGRAMMING INSTRUCTIONS ON YOUR ORDER. To see what is needed to personalize, please read the description of the item/items that you are purchasing. 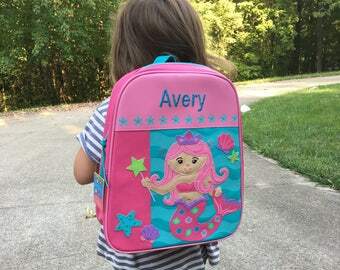 Personalized Child's Stephen Joseph Rolling Luggage PRINCESS CASTLE Themed for Children-No additional cost for the personalization. So cute and perfect size for my toddler. Thank you! I am extremely happy with my son's backpack! I highly recommend getting one for you little loved one. Top quality! All sales are final on personalized items. Personalized items are considered "Special Order" items as each is custom made to your specifications. No refunds or returns are permitted. 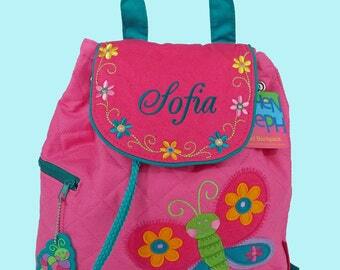 Please type names or initials carefully as your items will be embroidered exactly as specified by you. Damaged or defective items must be reported within 7 days of receipt to qualify for a replacement. Personalized items that are received damaged or defective will be replaced with an identical item only once the original item has been returned. No refunds or replacements will be made after 7 days. All orders are processed after full payment is made by credit card. If you need an item by a specific date, please contact me PRIOR to placing your order to be sure that I can accommodate your request. Depending on my current order volume some allowances may be made to accommodate orders requested to be completed in less than 7 BUSINESS days. There will be an additional RUSH fee of $10 for orders requested to be completed and shipped in less than 7 BUSINESS DAYS. Most orders are shipped via USPS First Class or Priority Class. Upgraded, Expedited and Insured Shipping is available for an additional charge upon request. You will be sent an email, with tracking information, when your order has been shipped. I guarantee that your order will be shipped. I do not guarantee delivery of items shipped via USPS First or Priority Class. It is HIGHLY recommended that you insure your shipment for an extra charge. Contact me if you wish to insure your package. If you live in the Columbia, Missouri area I may be able to save you the postage by arranging to deliver or you pickup your purchase. If you would like to make arrangements please convo me prior to making your purchase. *****Please Note****To send the monogramming or personalized names for an item you will need to enter that information in the box provided for you to leave a message for Deerpath Designs. 1) Name or initials to be embroidered. 2) Number of the font or monogram style chosen from the style sheet. The style sheet is shown as a thumbnail below he main photo of the item that you are purchasing. Click on the thumbnail to enlarge it. 3) Thread color or colors for the lettering. I do NOT post a thread color chart because colors do not appear the same on all computer screens. Custom refers to the monogram/personalizing instructions. No other changes or alterations may be made to the the products offered. Gift wrapping is not offered but I will be happy to include a personal note from you with the order. A shipping list is included but no invoice will be sent with any order. 2) Thread color or colors to be used. The Font/Monogram Styles that are offered by DeerpathDesigns can be found by clicking on the left or right arrow in the photo of the item that you wish to purchase. Advance the photos until you arrive at the Font/Monogram Style. IF YOU ONLY LEAVE A NAME OR INITIALS AN APPROPRIATE FONT STYLE AND THREAD COLOR WILL BE CHOSEN. To find the Font/Monogram Styles just click on the area on the side of the photo of the item you are purchasing. Keep clicking until you arrive at the Font/Monogram Styles. Choose the number of the style that you want and send that with the monogramming instructions. While I do guarantee that your order will be completed by the "Scheduled to ship by" date, I cannot be responsible for USPS delivery delays or non-deliveries.